I am taking a little break from my deadline stuff! Ugh…my brain is mush. Either deadlines bring out the best, or they bring out the worst… or, maybe it’s just a little of both! I keep wishing for a sandy beach. That is my favorite kind of vacation. Beach vacation. Anyway…with no beaches in my immediate future.. I think that I have been contemplating ways that can get myself on a beach. Really anything beach, sand, water, tan, RELAX. So this is the PERFECT solution! And I can’t stop thinking about it!, so lokoing forward to it… The ‘ultimate scrapbooking cruise’… this morning Beijing time all the teachers chatted online with the yahoo group answering questions and talking more about what they can expect and plan for… but I wanted to provide the most up-to-the-minute information on what we, (the teachers) have planned. This has been a really unique experience.. I don’t get a lot of opportunity to collaborate with other scrapbookers in the industry.. and I just love working as a group. Especially with such talented people! I have been catching up on their blogs, and learning more about each one of them as we have been figuring out how to make this cruise amazing. we are going to have a blast together, and everyone is invited! Ok, so I am posting this MONSTER LONG pdf that talks about what makes this an “ULTIMATE” cruise. I know that it’s a lot of stuff to read.. but hey, IT”S A LOT OF STUFF! 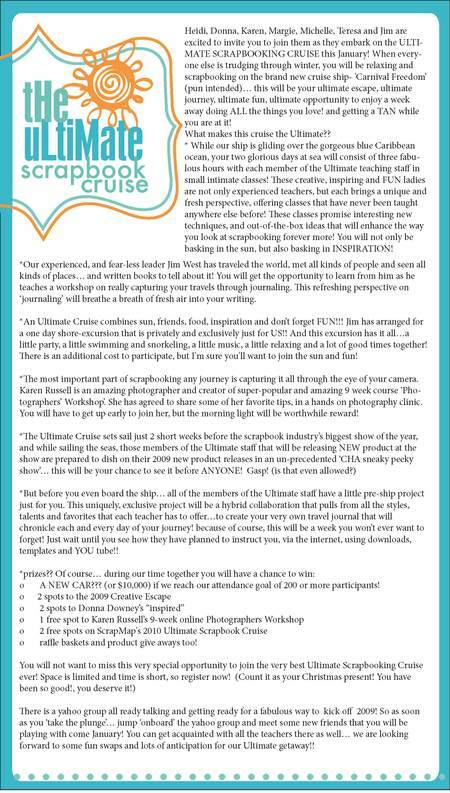 Seriously, if ever you were going to mix scrapbooking with cruising… this is the trip! and lots of people have booked with NON-scrapbookers…so grab your favorite person and give yourselves a little something fabulous to look forward to! for dates, cost, and more information… go to www.scrapmap.com. You can contact Jim West or Jaci Haag… they can answer all your questions. i am going to post links to all the teachers blogs so you can check them out, and their style... they are awesome, and just FUN! k, i gotta get back to reality! dont' worry, colton made brownies to get me through the deadline process...training him young to know how to make a stressed-out girl happy!